During your stay in Miami, you will most definitely want to keep those at home informed of all your adventures and fun while enjoying the Miami beaches and many Miami attractions. With technology, keeping in touch is very possible through phone, mail, and email. 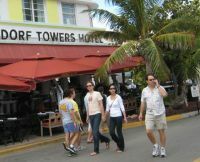 Internet access is available in most if not all Miami hotels, Miami vacation rentals, and cafés. When placing a local call in Miami, you must first dial the area code of the land phone or cell phone you wish to reach. The area codes for these are either: 305 or 786. Keep in mind that calling from your Miami hotel phone might be more expensive than using a public telephone. If you would like to have a cell phone during your stay in the City of Miami and at the same time you want to avoid the expensive charges, we recommend you to get a MetroPCS phone without a contract and with unlimited minutes. This is a great way to stay communicated with family and friends no matter the time difference or your plans outside the hotel. You could go to any of the following Metro PCS providers located in Miami Beach. Here, you can purchase the cell phone of your choice ($80-$300) and set up the plan that best suits your stay. Plan rates range from $30-$50 per month plus taxes, all plans include a flat monthly rate, no signed contract, first month free, unlimited minutes and local calling, and no activation fee. If you would like more information about the different plans and locations available, go to www.metropcs.com. If you wish to call home during your Miami travel, the most recommended way is through a telephone calling card which you can buy at any gas station, supermarket, and some small stores. The rates for these vary according to the amount and location where you wish to place your call. Make sure that the calling card you purchase does not have connection fees as these tend to waste the balance of the card leaving you with fewer minutes to talk. Latin America: 1.0¢ for Argentina, Chile and Venezuela, 3.0¢ for Brazil and Colombia. On the back of the calling card, the instructions to make your call are printed. - First, you dial a local number which will put you in contact with an operator who then will give you instructions to follow. - A PIN number is then to be entered followed by the country code, city code, area code and telephone number. On the other hand, if you wish to call directly, you would first have to dial 001 followed by the country code. These are a couple of country codes, should you need any. Go to www.countrycodes.com if the country code you are looking for is not here, or for more information for international calling.